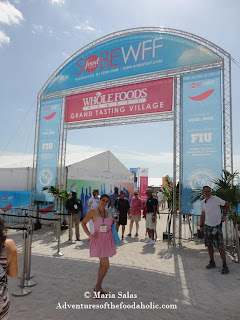 Take a virtual stroll with me through the sights of this year's SOBEWFF Grand Tasting Village! Yes, I"ll have a red please! 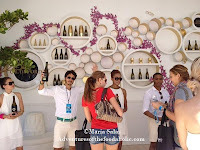 Excited to arrive at Saturday's Grand Tasting Village. 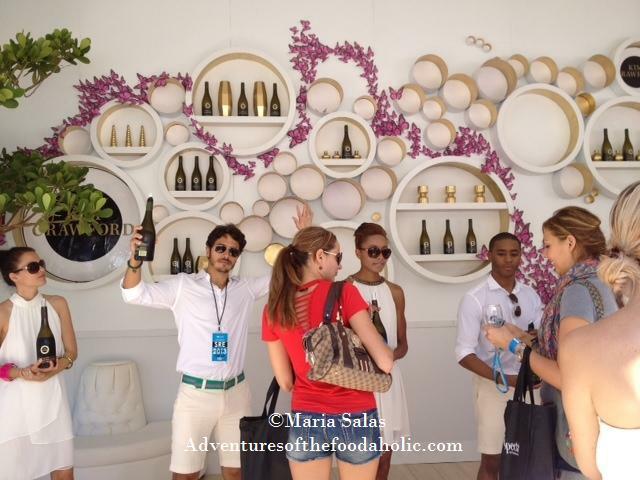 Guests were welcomed with a nice goodie bag full of samples and a wine glass to hang around their neck. The pouring began immediately with a choice of red or white from Kim Crawford. From there the walk through the village on the way to the tents began. 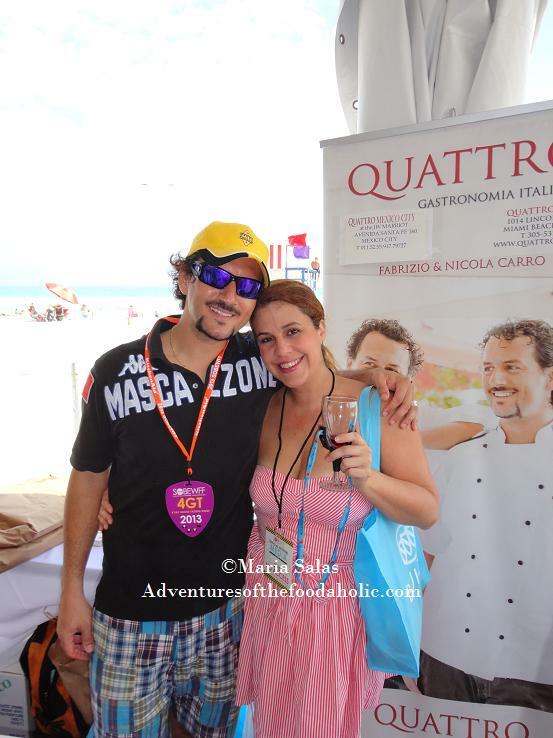 First stop was Experience Italy, where guests got to try some fabulous cuisine from the amazing twins Fabrizio and Nicola Carro from Quattro Gastronomia Italiana. 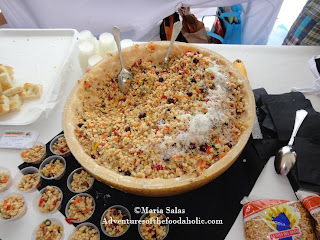 Oh, and by the way, the mouthwatering bite was made with Grana Padano cheese which is so palate pleasing, it will make you scream "O Sole Mio". Stay tuned for a behind the scenes look at me trying my hand at a delicious recipe using Grana Padano in an upcoming segment of Something's Brewing in The Kitchen. After a couple of glasses of vino italiano, I was on my way. Hey...what do you say I take the big bowl instead? Delizioso! Remember that "celebrity-filled road" I told you about earlier? 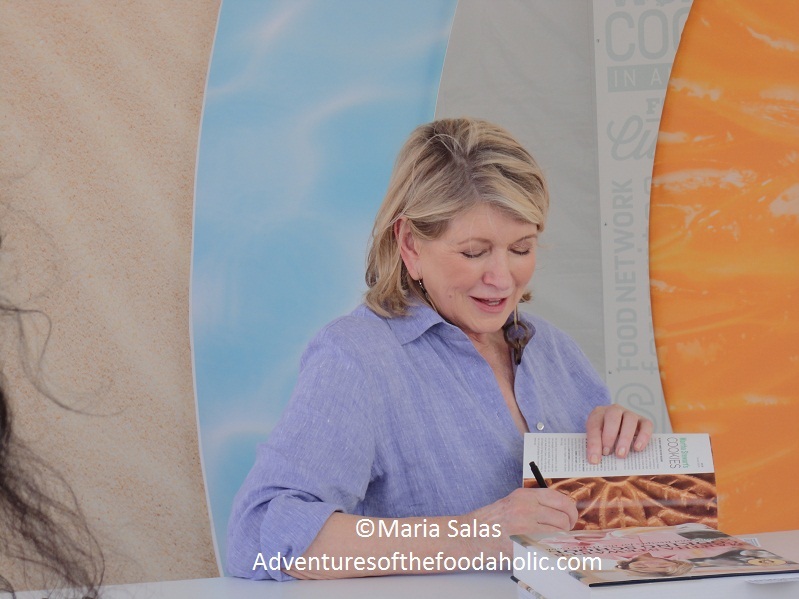 Well, I was on it and who do I happen to spot on my left signing copies of her book Martha Stewart's Cooking School: Lessons and Recipes for the Home Cook? Yes, you guessed it by looking at the picture: Martha Stewart. 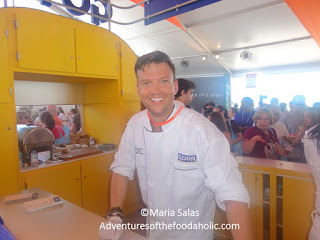 Over at one of the Kitchen Aid Stages was Tyler Florence, chef and television host of several Food Network Shows. Of course, they saved the best for last (although all of them were spectacular really) and out came American chef, author and television personality Anthony Bourdain with English food writer, journalist and broadcaster Nigella Lawson. 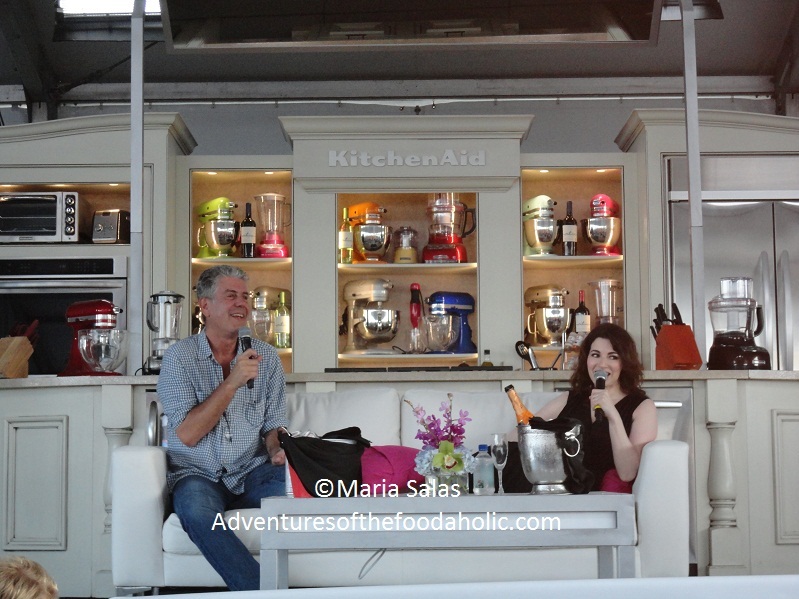 They sat on a couch and chatted about hot topics in South Florida such as Bourdain's episode of his visit to Cuba and their favorite culinary destinations. 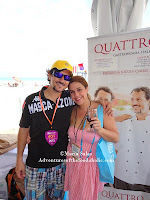 Along the way to the tents and once inside, I stopped and tasted some goodies from several exhibitors: Whole Foods Market, Wines of Brazil, and Goya along with a collection of restaurants I can't wait to check out like Aijo in Brickell and Catch in The Biscayne Marriott. 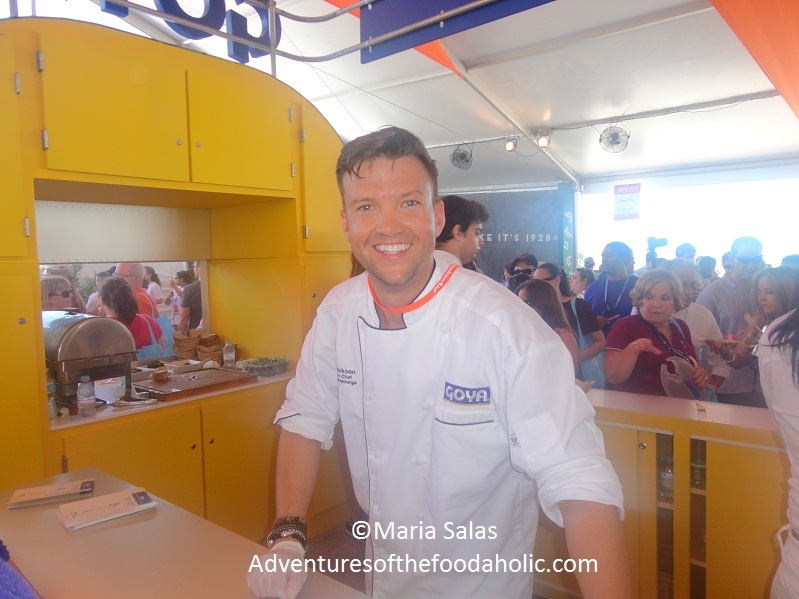 Chef Todd Erickson from HaVen South Beach was working his magic at the Goya exhibit where they also gave out some really nice goodies to take home. 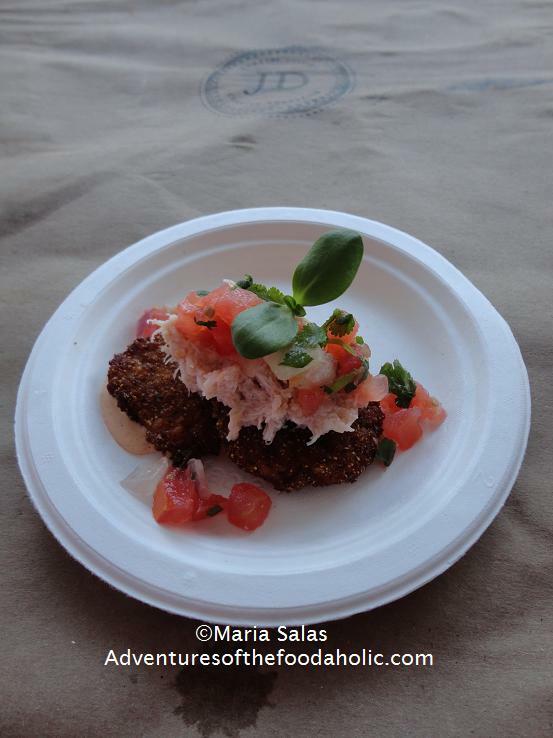 delicious bites at the Goya exhibit. 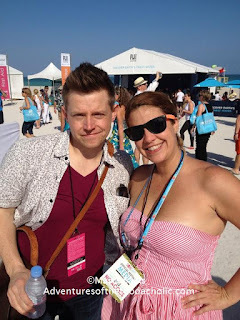 I finally made it to the Evian Water exhibit where all the action was taking place with TV Personality and Atlanta-based restaurateur Richard Blais and his interactive takeover of the @evianwater Instagram account; giving fans a behind-the-scenes look at the epicurean festival. Read all about it here: Instagram and Foodie Fun at SOBEWFF. We took some fun pictures and chatted with the charismatic chef. 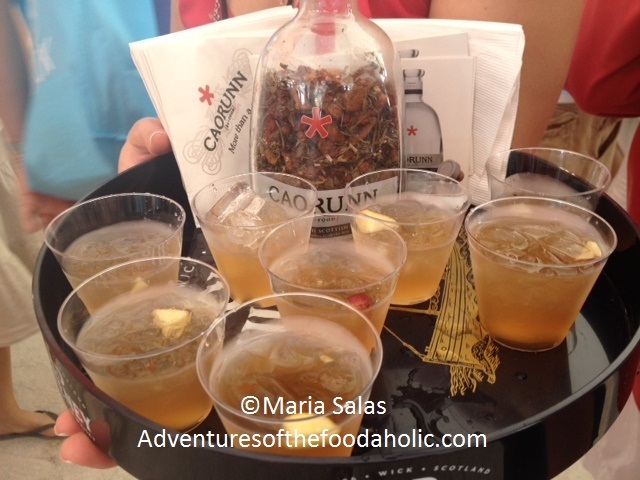 More drinks, more fun, oh boy! It was truly an amazing day and I could go on and on. 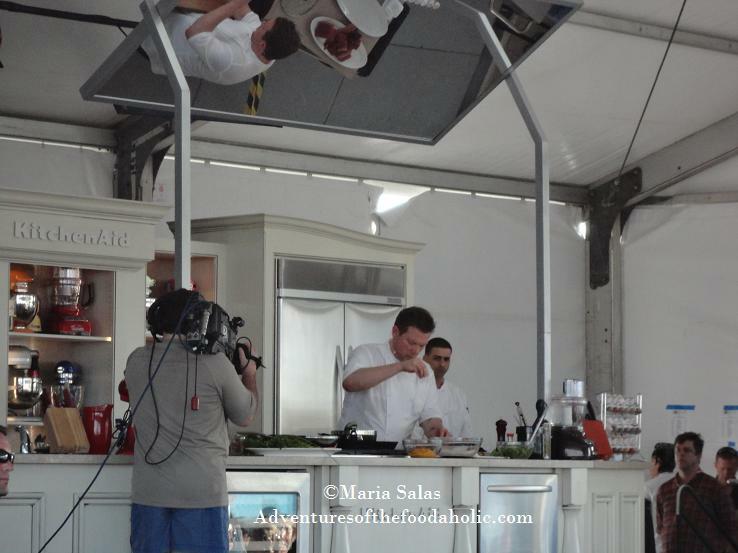 But instead, take a look at more pictures of my adventure at the Grand Tasting Village and other SOBEWFF events, on my Facebook page at Adventures of the Foodaholic and click on the Food Network South Beach Wine and Food Festival album. (Don't forget to hit the "Like" button while you're checking out my page). 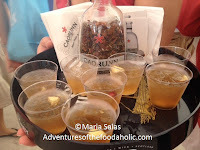 Next up, saying goodbye for now to SOBEWFF 2013 at the Guy Fieri and Ziggy Marley Closing Party held on the sand at The Ritz-Carlton South Beach. Time sure flies when you're having fun! Glad you stopped by. 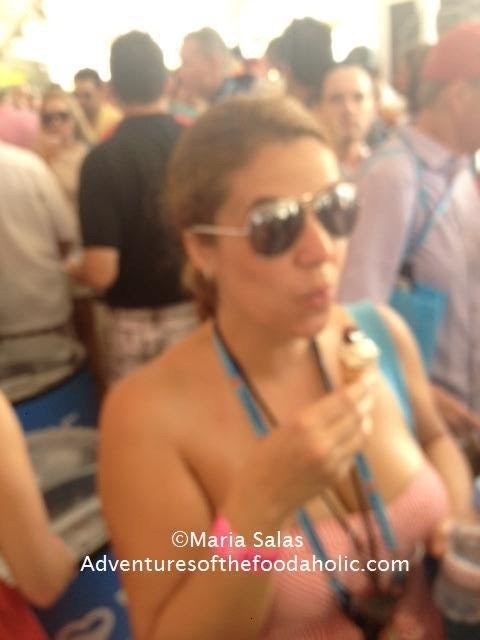 Maria Salas is a die-hard foodie on a quest to find the best bites and sips around. Whether in her hometown of Miami, or traveling through lands far, far away, she loves snapping her camera (and camera phone) to share her mouth-watering finds. Having a background in Journalism, and a deep rooted passion for everything gourmet, both in the kitchen and in the restaurants, Maria captures the essence of the dining experience through her humorous reviews and drool-inducing foodporn. She has been nominated for Best Food Blog and Best Instagram for the New Times, Best Food Blog for Johnson & Wales University's Zest Awards, and Best Food Blog for the South East Region for Foodable TV. You can follow her on Twitter, Facebook and Instagram, and don't forget to subscribe to Adventures of the Foodaholic to receive delicious updates. You'll never miss a bite again. Check out some of my Instagram Foodporn! Watch me on The Welcome Channel's Lincoln Road Segment as I give you the scoop on dessert!